The Capitalist's Bible, edited by Gretchen Morgenson, an award-winning journalist with the New York Times, is the essential guide to capitalism and its many languages, customs, and practices. Including thinkers like Adam Smith, concepts like supply and demand, and developments like globalization, The Capitalist's Bible is an essential primer that clarifies, informs, and answers all the questions that need to be addressed and fully understood in these difficult economic times. Everything you ever wanted--and needed--to know about capitalism . . . but were afraid to ask. What is capitalism, and will it survive? What does globalization really mean--and how does it affect your bank account? If capitalism, left unchecked, has caused disasters like the Great Depression and the financial crisis of 2008-09, why has it been the economic system of choice for centuries? To many people, the complex, jargon-rich world of capitalism can be intimidating, raising more questions than it answers. However, as the excesses and failures of free-market capitalism continue to hold sway over the daily news and our daily lives, understanding our economic system--including where it has succeeded and where it has not--is more important than ever. 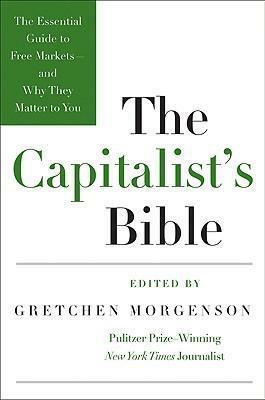 Edited by New York Times business journalist Gretchen Morgenson, The Capitalist's Bible is the essential reference on capitalism and how it works--from the people who champion it to the mechanisms and institutions that uphold it to the terms and laws that define it. Whether you seek a more well-rounded understanding of the ideology that underwrites America's--and, increasingly, the world's--economy, or simply wish to be able to speak more knowledgeably on the subject in conversation, this book is an invaluable tool for understanding capitalism.